Craig Primack, MD and Robert Ziltzer, MD, will be signing copies of “Chasing Diets” in AZ next month. 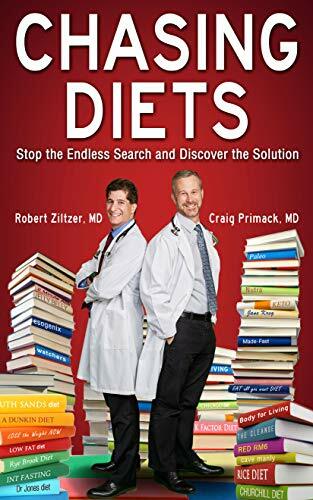 Craig Primack, MD and Robert Ziltzer, MD are the authors of “Chasing Diets”. America is addicted to dieting. There are millions of people who are sick—sick of being overweight. These people have been chasing diets over a lifetime and are ready to stop their endless searching and discover a solution to weight loss. There are thousands of diets and tens of thousands of diet books; each month a new diet book comes out with new promise and new hope. They all fail sooner or later, leaving the dieter ever more hopeless and more discouraged. Studies of self-help diets usually show no greater than ten pounds of weight loss after one year. In truth, self-help dieting is a no-win venture. Self-help and “next best diet” approaches ignore the fact that obesity is a medical disease that, in most people, requires medical treatment. Doctors Craig Primack, MD and Robert Ziltzer, MD discuss the shortcomings of self-help diets, and more importantly show dieters how to find a weight loss program that works—for life! Founders of Scottsdale Weight Loss Center in Arizona, Drs. Ziltzer and Primack have worked with thousands of patients who have found that medical management is the essential ingredient to success. The four-pronged comprehensive weight loss program explained in Chasing Diets is designed to use all the tools available today: medical management, proper nutrition, activity and sleep, and education. Used together, these tools can empower people who struggle with obesity to stop the search and arrive at a solution for losing and maintaining goal weight.